Comedy Bang! Bang! is an odd little series: not quite a talk show, not quite sketch comedy, not quite a variety show. Its tone is distinct, but its appeal can be hard to explain. But like most mysteries, the curious case of the talk show’s charm yields to careful examination. As Pam Beasley on The Office, Jenna Fischer served as the voice of reason and compassion, and she brings the same genial accessibility to her guest spot. That warmth softens the backstage murder mystery that leaves Guy, new CBB tour guide, sprawled bloodily on the studio floor (with other victims to follow) and the on-stage antics of the Calvins brothers, “the preeminent promoters of the sport of horse-fighting in these great United of States.” Comedy Bang! Bang! is never afraid to go dark, but this one-two punch of morbidity could easily spin its usual absurdity into grimness ill-suited to the show’s light tone. The episode balances its darkness and whimsy by honoring the series’ tacit guiding principle: It’s ironic, but rarely sardonic. (This is just one way the IFC show differs from the podcast, which often weaves a caustic tone into that glib brightness.) Comedy Bang! Bang!’s greatest appeal comes from its amiable intelligence, the ease with which it fondly mimics the tics and tropes of light entertainment, re-contextualizing the familiar to make it fresh and funny, proving that parody needn’t be biting to be accurate. Even the Calvins twins are imbued with earnest purpose and emotion, however perverse. Yes, their vocation relies upon depraved and habitual acts of animal cruelty in which two magnificent thoroughbred horses “get up on they haunches, they put on the gloves, and they punch each other ’til they dead,” and yes, these horse fights occur several times a day every day, leaving an incalculable number of horse corpses littering the Calvins Twins’ Family Bee Honey Taffy Farm and Horse-fighting Ranch. Nathan Rabin describes the value of earnest, knowing enjoyment in his essay on Analyze Phish, the Earwolf podcast in which Harris Wittels teaches Scott Aukerman about the appeal of the often derided jam band. As Rabin observes, “honestly attempting to understand a much-derided but enduring pop-culture phenomenon isn’t just better for the spirit than glibly making mean jokes; it’s a hell of a lot funnier.” Comedy Bang! Bang! takes that honest understanding of its pop-culture targets and wrings comedy from mimicry, not mockery, skewing talk-show rhythms without skewering them. 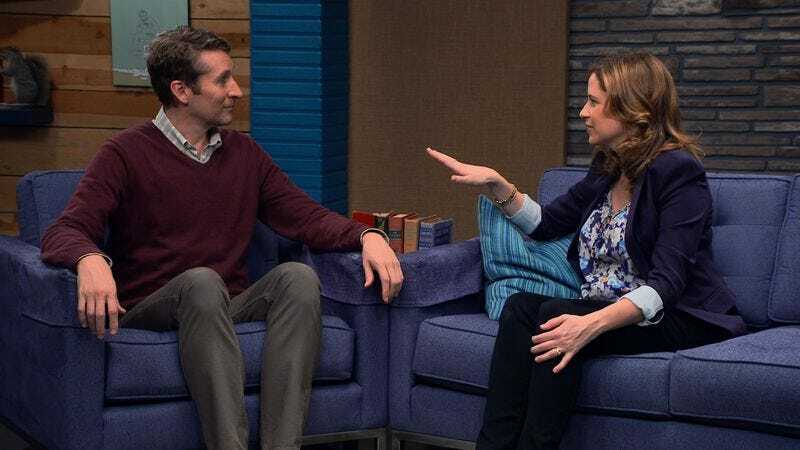 As always, the weird and happy world of Comedy Bang! Bang! resets at the end of the episode, with the string of murders solved not by the smug Inspector Gantlet but by Reggie Watts, who sums up the evidence with the plummy aplomb of Poirot, unmasking the culprit and restoring order even as he confesses to accidentally providing the cover of darkness that allowed the killer to continue his murders. This episode is dedicated to the memory of the many lives lost during its filming: Guy Balfour, Mark Paul Posner, Gwendolyn Bruznik, Prof. Hans Ketchup, and the horses of the Ca. Fa. B. Ta. Hu. A. A. Ho. Fi. Ri. Ra. As the names of the dead play across the screen, the survivors belly-laugh over Reggie’s fatal flub… because you gotta laugh. Scott’s screen credit: Khaki Dockerman. This episode included several pairs of khakis. Can you spot them all? It’s Spot The Khakis, a fun learning game from Sullivan’s, the inventors of Zordic Assassin and Clive Bryllis’ Adventure In Time! That’s Ron Lynch of Home Movies as Prof. Hans Ketchup. Who else wanted to hear the Transylvanian equivalent of “You bloomin’ onion, go clean a chimney”? It’s no surprise the Murder, She Wrote tag nailed the mystery series’ distinctive font, but the Jessica Fletcher-approved Royal typewriter illustrates a gratifying attention to detail. Comedy Bang! Bang! feels like a seat-of-the-pants production, but that’s a carefully constructed allusion.